Narrowing of the arteries outside of the heart can also occur. 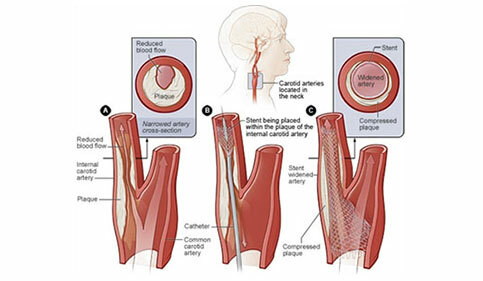 Narrowing of the Carotid Arteries can result in an increased risk of stroke. 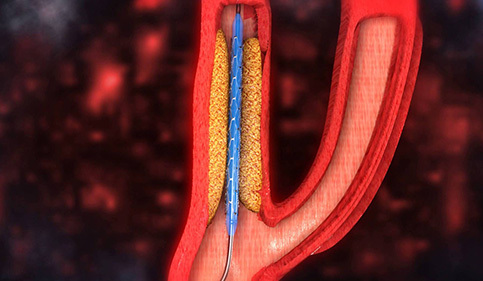 Carotid angioplasty and stenting is a procedure where a narrowed carotid artery (an artery in the neck that supplies the brain) is opened up by ballooning and stenting. Carotid angioplasty and stenting is usually performed when the carotid artery narrowing has already caused a stroke. This minimally invasive technique is an alternative to surgery to remove the plaque that is causing the carotid artery narrowing, in patients who either are at increased risk for open surgery or who refuse surgery. 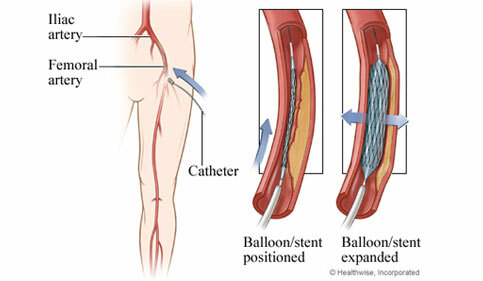 Peripheral artery angioplasty is a minimally invasive technique where balloons and stents are used to dilate the narrowed arteries that supply the upper limb (subclavian arteries), the kidneys (renal arteries), and the lower limbs (the iliac arteries, the femoral-popliteal arteries and the tibial arteries).